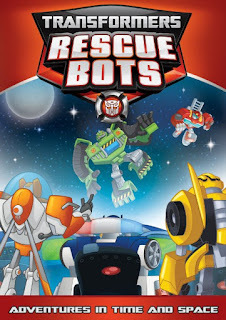 The Rescue Bots take their adventures through time and space! This heroic collection of Transformers: Rescue Bots will be released on DVD on February 23, 2016 from Shout! Factory Kids, in conjunction with Hasbro Studios. Featuring five exciting episodes that the whole family can enjoy, this DVD is priced to own with a suggested retail price of $14.93. Purchase Transformers Rescue Bots: Adventures In Time And Space on Amazon for $9.99 & FREE Shipping on orders over $35. Griffin Rock’s Autobot first responders (Chase, Heatwave, Blades and Boulder) are back for five more action-packed adventures in time and space! These first responders are all about protecting their Eart friends at all costs! My son is a huge fan of this series, but due to bus schedule and school he usually misses it on the television. It is nice to have this DVD to pop in when he gets done with homework to catch up on his favorite Transformers and what they are up to! The DVD is almost two hours long and broken up into five episodes.